Also, don't forget to 'like' us on Facebook for updates between newsletters. Are you a program manager? This training focuses on how to develop a reflective and engaging learning environment with your staff. Learn how to create the context to share important concepts of quality youth programming, and develop the practice skills of your staff. or call 651-487-7383. Trainings are designed to address the professional development needs of Sprockets Network Partners. The 2012-2013 training calendar provides training opportunities for staff of all levels. Check out what is available and sign up for the training that fits YOUR needs. How can afterschool programs support school success if their focus is not tutoring and homework help? How do we help young people be successful in the classroom by maintianing our commitment to best practice youth work? Five Sprockets network partners are coming together to find out. Over the next year, the Sprockets Accelerators will work with each other, Saint Paul Public Schools and other experts to get intentional about how their programs help youth aim higher. A year from now we will highlight the practical applications and best practice learning of this group. Organizations include: Community Design Center, Commonbond Communities, Conservation Corps, YMCA and YWCA. 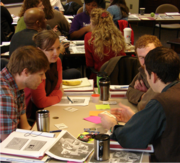 The 2011-12 Minnesota Walkabout fellowship was a year-long effort to bring experienced youth workers together to generate more wisdom, language and leadership around youth worker preparation and practice in Minnesota. At both the state and national levels, a growing collection of standards, competencies, credentials and career pathways are being established to guide and standardize youth work preparation and practice. Read about what our colleagues found in exploring the field of youth work in their papers. Summer planning is here! Does your program serve young people that typically attend summer school? If so, you will be glad to know that the 2013 Summer School calendar has been confirmed.